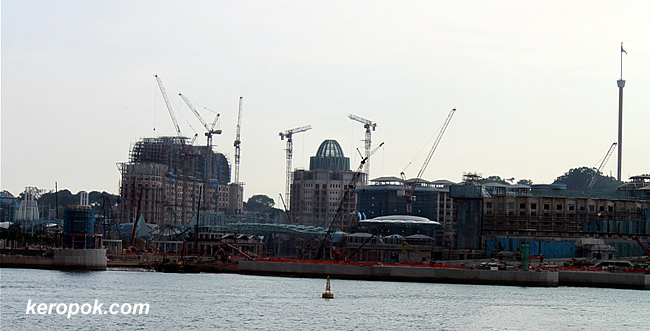 Everytime I take a look at Sentosa from VivoCity, the constructions seems to be going up rather quickly. This should be Universal Studios Singapore being constructed. Read from the newspapers that they are constructing 18 new rides, and some only available in Universal Studios Singapore. Have you been to any of the Universal Studios around the world? Yeah, we visited the one in Anaheim, LA. Hot like hell n hubby reminded me that California is desert country ! Few visitors fainted while waiting in the long queue, so it's pretty serious. There were hardly any shades ! For years I hv been saying that SG needs a theme park for a nice change to just eating as a pastime. It's now within reach n I'm very glad indeed. I only had time for Disneyland and not UnivStudios at Aneheim. Sigh..
Lots of waterside developments in the UK too, but no plans for Universal Studios yet! looks cool.. but the question i wanna ask is.. when is the casino up? ada delay kah.. I don't know. The HQ is in KL. Ask uncle lim? Orchard Road Lights : Turned On!